Itching to spend some quality time with Intel's new Core i7-8700K processor? Well, imagine if you could without spending a penny! To help make one reader's dreams come true, HEXUS has teamed up with Scan Computers and Asus to give you the opportunity to win a 3XS Z370 Vengeance Ti base unit worth over £2,000! This powerhouse gaming rig comes equipped with the Core i7-8700K liquid cooled and overclocked to 5GHz as standard, and the six-core chip is joined by 16GB of DDR4 memory, a 500GB M.2 SSD and an extreme Asus GeForce GTX 1080 Ti Strix Gaming graphics card! An incredible machine for both work and play, but you know what they say - you can't win the raffle if you don't buy a ticket. To be in with a chance of winning simply answer the following question to enter our free prize draw, and don't forget, you can also claim a second entry via Facebook. Need a clue? You'll find the correct answer at scan.co.uk. The competition winner(s) will be picked at random from all eligible entries that arrive by 22:00 GMT on the closing date, November 2, 2017. The winners will be notified via email by November 9, 2017. The winner must claim their prize within 7 days of the promoter sending notification. If the prize is unclaimed after this time, HEXUS reserves the right to offer the unclaimed prize to a substitute winner selected in accordance with these rules. Very nice. 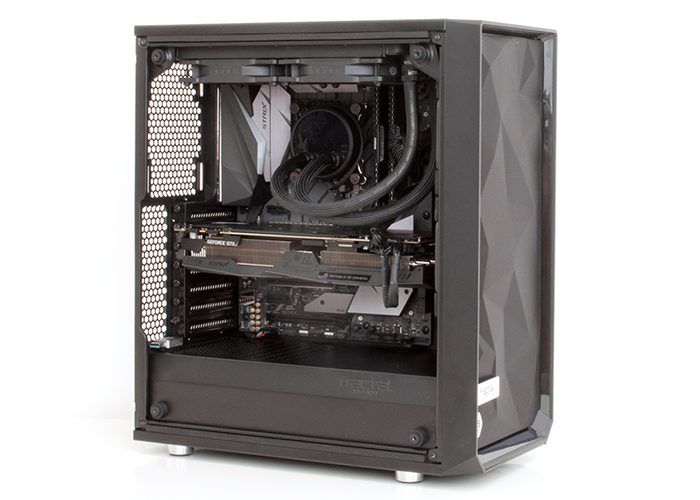 A fan of the Fractal Design cases, which tend to move away from the typical “gamer” aesthetic. Good prize! thanks to Hexus, Scan and Asus! this is probabaly the last time I get to tick the 26-35 age box. its all going downhill in a few weeks. tis the end I tells you!